Thank you for being involved and helping us to make this decision! Before you vote or make any comments below, please ensure you have read the blog post fully. It won’t help the discussion if you haven’t! Today, we’re coming to our community again to ask for your help with a tricky decision. Once you’ve read it, we’d love to hear your thoughts — both as votes and as comments below. Don’t forget, the poll is designed to be indicative — if there is a clear winner, we’ll choose that option, but if the results are all relatively close together, we may make a decision taking into account all of the discussion and feedback, as well as our long term vision for Monzo. We’ll aim to close voting in a week from today. Will Monzo Continue To Offer Free ATM Withdrawals Outside the UK? Will the current account debit account have the same benefits when abroad as the prepaid? The Next Step: Current Accounts! Help please! I need my Monzo card ASAP! A big thank you from Monzo on our 3rd birthday! How about merging options 1 & 3. Free up to £200, then 2% in Europe and 4% in the rest of the world? This might prove unpopular, but I’d prefer to pay a small monthly fee to offset the loss to Monzo, to ensure it becomes a sustainable business and offers more features in the future. I’d go with a reasonable yearly allowance and there after a reasonable percentage. Personally, £200 / month wouldn’t be of much help. I don’t travel monthly but when I travel I’ll definitely need more than £200. I think something like first £1500 withdrawn outside the UK free and then a percentage would be awesome. How about applying a restriction to those who are milking the system? I.e. Taking the top 20% of of overusers and warning them of there abuse of the system. If they continue to abuse it enforce a restriction on them. I agree with this. I like the idea of a free allowance. But since I’m guessing most people only go abroad on holiday once/twice a year, doing a monthly allowance doesn’t quite make sense. Especially since the target audience for the allowance are people who don’t go abroad often and abuse the ATM system. I agree with tudor - a yearly fee-free allowance would make much more sense than a monthly one. After the yearly allowance is exceeded, a lower percentage could be charged for European withdrawals and a higher percentage for non-European withdrawals as in Option 1. If you’re going well above £200/month, then you’re already definitely in the 13% of customers statistic! Sadly £1500 of international ATM withdrawals costs £30. We’re trying to figure out the fairest & most transparent way of meeting this cost. I travel a fair amount, going to Europe and outside Europe. I don’t think I’ve ever withdrew more than $200 in a month so it makes sense that Option 3 works best for myself. But both the USA and Europe support card payments almost ubiquitously so this could be unfair on people who travel to countries that don’t readily accept card payments everywhere. Props to Monzo for leaving this decision to the users if it isn’t a close race. That said, preferential voting would’ve been my preferred voting mechanism! I’d prefer Option 3 then 2 then 1. I think that a fee free first £200 with anything over is the best option as it rewards the casual user and places the onus to pay on the worst offenders. I would be interested however to know how you plan to calculate months? i.e. a rolling month or a calendar month? I’m happy for Option 3 or as an alternative, charge an optional monthly fee for those of us who do Travel a lot. I use my Monzo card abroad a lot, but I’m pretty much cashless so I tend not to withdraw cash, but I’d still happily stump up a monthly fee to avoid charges and help fund Monzo. One of the things that I liked the most about your card was no fees for taking out cash. I am not sure if I will continue to use it if you will start charging for this. In my opinion there should be option 4 with much higher monthly allowance like 400 or yearly allowance like 2400. 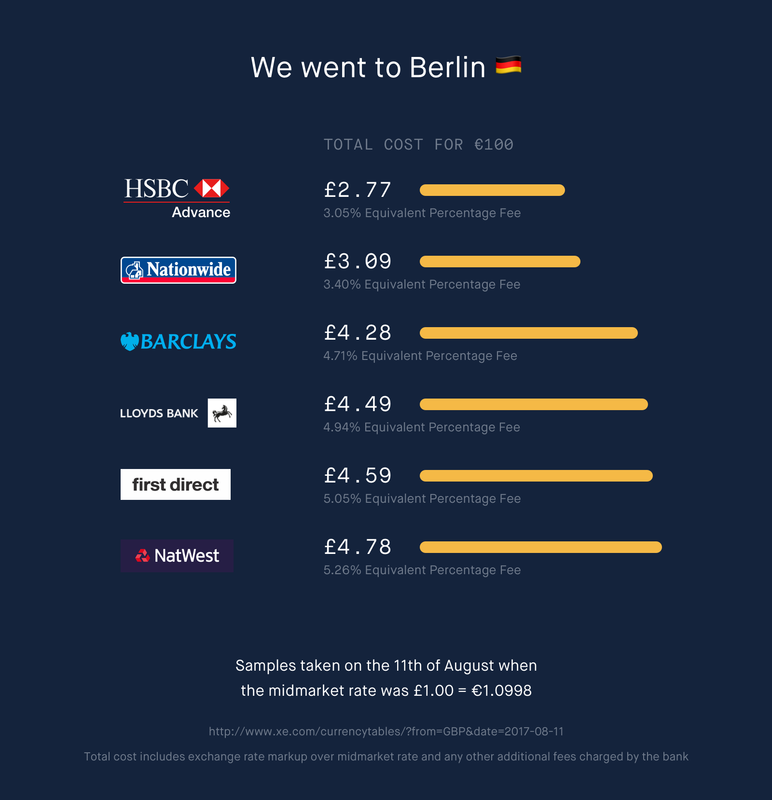 Fair enough but wouldn’t 200/month be exactly the same in terms of costs for Monzo over the course of a year? If I had a £200 / month allowance I think I’d use that and then withdraw using another card provider that offers free withdrawals. Or just use a travel card all together. If you go abroad often, or even live in a european country, you rarely actually have to get cash out, to be honest – a surprising amount can be done card-only in most of europe. Even in the most remote areas in western europe, you wont need that much in cash. I think this is a good idea, but perhaps the Monzo data guys would be able to figure out what threshold that yearly allowance would need to be at to break even. If most people only travel abroad 1 or 2 times a year, then this would benefit them. Anyone who travels on a far more regular basis would then need to start paying for these transactions. I think this logic works if Monzo continues to be a bank and not an international travel card, as it has set out to do. Option 4: Only allow active UK users free withdrawals outside the UK. charge inactive UK users 2% for overseas withdrawals.